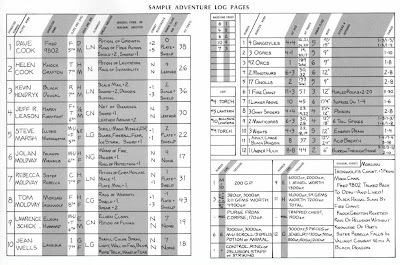 In its never-ending quest to publish more products to sell to its customers, TSR released a number of peculiar items; the Dungeon Masters Adventure Log was one of them. Appearing in 1980, it was basically a collection of blank forms for the referee to keep track of important information during play. Exactly why anyone thought this was necessary, I don't know, but, seeing as I owned a copy of this book, I suppose I shouldn't point fingers. Anyway, the Adventure Log is noteworthy in a single respect in my opinion and that's the page I've reproduced below. It's an example of how to use the forms and there's some really great stuff in there, including the first appearances of characters like Black Dougal, Morgan Ironwolf, and Sister Rebecca. If you haven't looked at this sample page in a while, do yourself a favor and click on the image to do so. I think there's a lot to be gleaned by examining what's written here, even if, as is likely, it's entirely fictitious and bears no relationship whatsoever to an adventure played by the TSR notables whose names appear on it. So, my question for today: what single detail on this page do you find most interesting and why? I'm not necessarily expecting profundity here -- though I certainly don't object to it -- but I am curious to hear what others notice about the sample entry and what it might tell them about D&D as played in 1980 or thereabouts. Elron Hubbard is a Magic-User/Thief... a political statement? Well the guy whose largely responsible for me playing D&D (Kevin Hendryx) is on there. That's pretty cool. What strikes me is the gross factual error...everyone knows Black Dougal died of poison! The section for "marching order," which I remember obsessing about in the early '80s (back in the days of linear, 10' wide hallways), but which has since been completely supplanted by the more tactical approach of the later versions. For what it's worth, I used a similar, homebrew page in my campaigns up through 2006, but the most important aspect was always the ability to track changes (to hp, spells, items, etc.) , rather than record the initial stats. This product provided the idea, but like most things produced by TSR, we simply took the premise and created something better for ourselves. The size of the party seems preposterous nowadays, but I remember those days, and it wasn't actually that strange. At this moment, what puzzles me most is that with a party of 10, with multiple M-Us, multiple fighters, and enough thieves to give the DM paper cuts from note-passing, THEY ONLY HAVE ONE CLERIC (and she dies in the course of the adventure). Also, how the hell are they carting around the tens of thousands of coins of loot? I always saw Black Dougal as a rather inept Thief, now I realize he really had no chance against that poison needle. Poor guy. Most interesting to me is the silly names, Elron Hubbard and Fred 9802. My groups always had plenty of those, but I always felt that was "wrong" and would never be condoned by luminaries such as Cook and Moldvay. I was raised on AD&D which gave me the impression that verisimilitude was serious business. 1. A 20% casualty rate in this adventure (2 PCs died). 2. "Fred 9802 talked back to Odin -- and Lived!" Wonder what impetuous 9802 said? 3. "Elron Hubbard" is a thief/m-u. Heh. The hps for the Gnolls and Orcs are listed as 'total'. I wonder how a DM might use that during a fight? Several characters have magic swords, yet none of those supposedly glowing weapons is listed as a light source in the "Light" column. While reading this entry, I was trying to figure out whether I had ever owned this product. Then I saw "Fred 9802 talked back to Odin -- and Lived!" and knew I had. That's what jumped out at me: the fact that that line has stuck with me for 30 years. No need for a lot of cramped writing or short-hand. I think it's cool that there appear to be some husband and wife co-gamers on there (the Cooks and the Moldvays). I could be mistaken - they could be brother/sister or even just coincidentally have the same last name. But, assuming that they are husband-and-wife, then I think it's interesting how the game was promoted as more of a family game versus the "popular" image of a bunch of sweaty guys in black concert t-shirts eating Doritos and playing in their friend's mom's basement. The ’name’ 9802 was the thing that caught my eye too. My head started to spin tales about Fred actually being a robot (’cause that’d be cool y’know). As a DM, what I've found important to keep for myself are notes on things I might want to check without the players' knowledge - saving throws in particular, retainers' morale and loyalty, and passive detection abilities. The info on the TSR log seems almost oriented toward creating a memento, rather than a useful in-play aid. Certainly a lot of the info is redundant with what is kept on character sheets and adventure keys. If I'm not mistaken, that's Jeff Dee's penmanship on the entries. He has a rather distinctive lettering style. For some DMs, I can see where that would be useful. Our current gamemaster, for instance, who believes in hitting us with really nasty opponents, rolls really well, and then is surprised when the character with the highest HP nearly dies in a couple rounds of being beaten on. "I thought you had a lot more HP than that" is not what a player wants to hear! At any rate, having a quick reference like that, of all the session's relevant stats for the party and their opponents, on one single sheet of paper in front of the DM, should save time by cutting down on all the shuffling through paper and/or electronic files. OTOH, I think it would conflict badly with the work styles of most of the DMs I've had. Being able to keep it afterward as a memory aid would also be useful. Fred 9802 reminds me of when we used to just number our characters (Fred 1, Fred 2...) because they died so often. No wonder Fred is up to 9802 since he seems to have a habit of mouthing off to powerful deities. Unless the Gnome Illusionist has an 18 in both Int and Dex, he's exceeded his level limits. While it's very possible he had those ability scores, I note that no mention of his high dex is mentioned in the "combat adjustments" column. Maybe he used a Wish. Well one thing noticeable is that these are some of the example characters and real-world crew that put together B/X--playing AD&D. Which version do you think they actually played in Lake Geneva at that time? I loved this product, and I used it all the time back in the day. Remember, this was long before personal computers were actually useful and could generate similar documents. These pre-printed forms were pretty well lain-out and summarized a lot of essential information, especially the left page (I didn't use the right nearly as much). Plus, since they're all in one book, you have an ongoing campaign record. I dunno, this was one of my favorite accessories. And I loved looking at the sample page above! It should also be mentioned that this book had a middle section with pictures and descriptions of all the obscure weapons (hello, polearms!) and armor mentioned in the PHB, as well as some other good reference material. I though that stuff was pure gold. 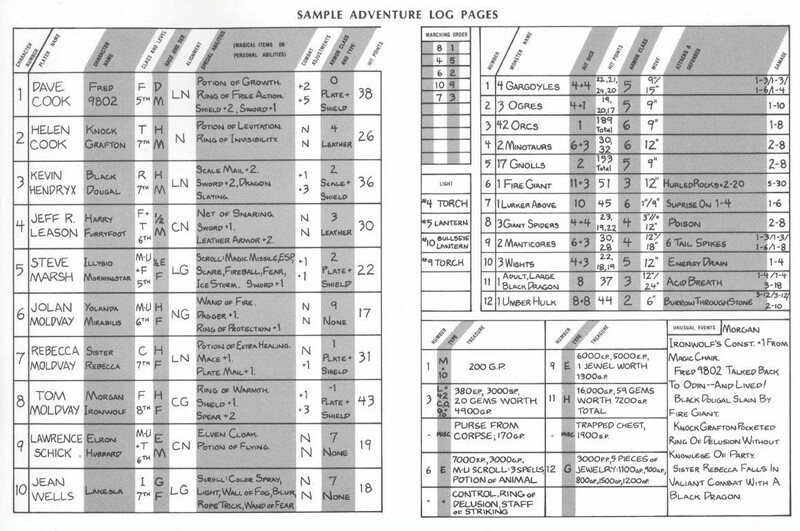 Now, if you want an example of a useless AD&D1e accessory, how about the NPC sheets? Eye-bleeding orange sheets perforated in the middle so that they were each 4.25" X 11"? Complete waste of paper. A 7th level Cleric single-handedly faces off against a large adult black dragon? And lived? Whoa! The small size designated for possessions strikes me. Of course, it's probably best used to just list notable, magical possessions. It's already bursting at the seams as-is, and doesn't list a single "personal ability"! I've seen a few character sheets in the day that don't provide a large enough possessions section (once in a monty haul-style game, naturally), but it does make more sense here. ...Still. The death of Black Dougal. Don't worry folks... Black Dougal has an alternate dimensional version of himself that lives on in Revolt on Antares! Akrasia already said it. Elrond Hubbard's classes. I have a hard time imagining a sample character of comparable power nowadays being so "weak." That reminds me of the adventures of Sick Sword, from back when this was Usenet, not the Internet (much less the Web). "No, that's no good. Keep rolling until you get an 18." One large, flawless diamond. Remember, this was back when every town had a shop where all coins and treasure could be freely interchanged. Except the cursed ones, which was sometimes how you found out about the curse. I'm pretty sure Sister Rebecca was Tom Moldvay's sister Rebecca. I used the DMs log for every AD&D campaign I ran and found it extremely useful. Nevertheless, I almost never used the right hand page. Coincidentally, I busted out my DM's Log just last month to use in a new AD&D campaign my cousin and I are playing. What I found to be much more useful and interesting than the sample forms was the page listing combat modifiers. There is no other compilation like this in any of the hardbound books or even the DM's screen. It included mods derived from spells, environmental, and situational factors (e.g. attacking stunned opponents, fighting while intoxicated or enraged) There are also separate mod charts for HPs, damage, AC, and even missile fire. Great stuff! I also think that the DM Log offered several useful additional tools and handouts, besides the log pages and the inspriational example on the inside back cover: there were a number of useful charts and tables in it, and a set of illustrations clarifying the nature of various obscure polearms, and illustrating the various armors types. James said: I think there's a lot to be gleaned by examining what's written here, even if, as is likely, it's entirely fictitious and bears no relationship whatsoever to an adventure played by the TSR notables whose names appear on it. While I can't speak for the other PCs listed, offhand (although IIRC Kevin Hendryx commented to me in a PM several years ago that Black Dougal was also a real PC), I can vouch that Illysio Morningstar was a real PC run by Steve Marsh, since I own a binder of Steve's PC sheets, and Illysio is in there. I always assumed that the PCs were real, and just another example of allusions and homages to players and their characters from the Lake Geneva campaigns (much like Robilar and Mordenkainen are mentioned in the World of Greyhawk entry for the Wild Coast, Mordy and the other MUs in the PHB, etc.). Some other tidbits: Tom and Rebecca Moldvay were siblings, not husband and wife (Rebecca is Tom's only surviving sibling; Jolan was another sister, interested in photography---I believe that Rebecca is Tom's only suriving sibling). Similarly, I think that Dave and Helen Cook were siblings too, but I'm not sure about that. And the handwriting is definitely Jeff Dee's! 'Sister Rebecca Falls In Valiant Combat With A Black Dragon.' Perhaps you read it as her FELLING a Black Dragon? Hmm.. Spear+2, you don't often see Magic Spears on Pre-gens/Example Chars. Ring of Warmth. Useful, but also not shown much on (N)PC sheets. These aren't flashy, and therefore not that interesting, I guess. I'm gonna pick this up. I never had much interest in it until this review(Cuz I didn't know Morgan Ironwolf graced its pages! ;-)). Thanx James! Trying to remember whether this supplement graces one of my storage boxes (I took a look at the cover on Wikipedia and it looks "familiar"). I'm almost flabbergasted by how little magic these PCs own - at 5-7th level most of the characters have a couple of very basic magic items and a couple of disposable ones. I only see two suits of magical armour and 7 magic weapons for a party of 10 PCs (which is a darn big party in my experience too). It's been a few years, but I seem to remember c. 1980-82, by 3rd/4th level the PCs in my campaign all had at least basic magic armour; most had 2-3 magic weapons (1 or 2 basic, plus something with special pluses or abilities); a couple of miscellaneous items, and at least a large pouch worth of potions & scrolls. Sheesh, and some players claimed I was a little on the stingy side, LOL. Notice how the *ranger* is Lawful *Neutral*? Not too many of those runnin' around. That's like having a Chaotic Good paladin. 1) Character death is noted as an 'unusual event'! 3) or maybe the unusual part was 'valiant'? B. HOW many player characters??? C. Nowhere to record marching order! @Bwian Marching order is at the top left of the second page.